Show your special girl that she's tops on your list with this fun A+ charm from CHARM IT! Perfect for celebrating effort and determination in school, sports, and so much more, this CHARM IT! 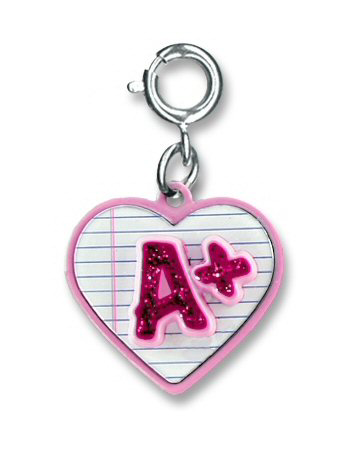 A+ charm features a glittery hot pink A+ on a heart-shaped background of "notebook paper" and is a great way to say "You're awesome!" With a simple snap of a clasp, girls can personalize their CHARM IT! jewelry with this CHARM IT! A+ charm. Celebrate accomplishments and victories - large and small - with this festive and colorful CHARM IT! Congrats! star charm.